Here is the second incarnation of a Braitenberg vehicle. This one is almost half of the size of the previous one and it is programmed to “love”. That means it sticks to the light source and does not try to overrun it, as the “aggressive” first one. This is another breadboard compatible header board, that I am working on. This one is for all 28-pin AVR devices, ATmega48, ATmega88, ATmega168 and the latest ATmega328. Component count is low and there is no voltage regulator on board. That makes it easy to power it from various sources. As a bonus, this board is a hybrid of through hole and SMT components. It has two SMD LEDs under the hood. Great to learn how to solder surface mounted devices. The Arduino can talk over a wide range of networks. Ethernet, Bluetooth, Wifi, XBEE and GPRS to name the most known. I had a Telit GM862-GPS module laying around, unused for some time already. It has GPRS and GPS capabilities, both accessible with AT commands. So I decided to port some of my code to the Arduino. Jonathan asked me, if I would like to do a project with him on Braitenberg vehicles. After some research and reading the first couple of chapters in Vehicles: Experiments in Synthetic Psychology, I was hooked in. Here is the first version of a Braitenberg vehicle, powered with two RC-Servos and an Arduino as its brain. Best of all, it needs no soldering, drilling or hot glue. And if you’ve played already with Arduinos, there is a good chance, that you have already most of the needed parts at home.. 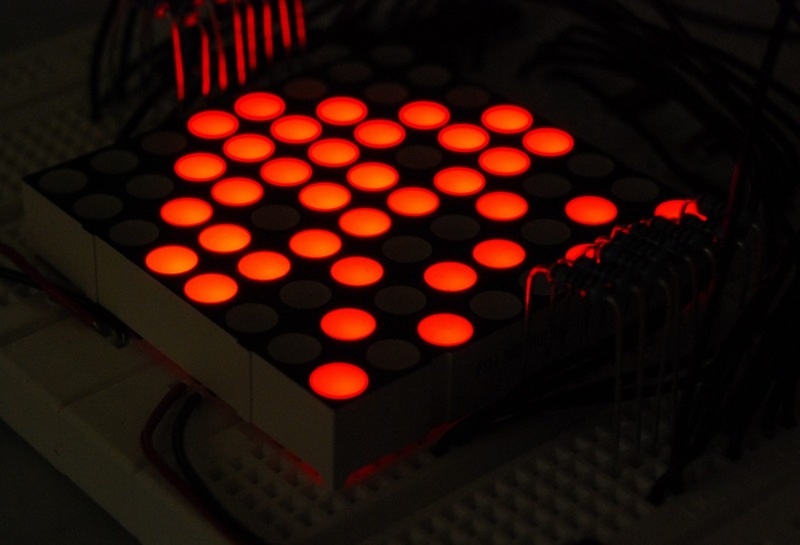 Lately I was playing with my dual color LED matrix from Sparkfun. It is a matrix of 8 by 8 dual color (red and green) LEDs that measures 5 cm by 5 cm. I just had some sprites flickering across the matrix as the magnifying glass of my “third hand” came in the way. I realized, that, if in the right distance, it will project the sprites on the ceiling. Although the projection is not very bright, it works, if the room is dark enough. Disco, here I come. BlinkM is a smart LED, developed by Tod E. Kurt from ThingM. In a way it is a cousin of the Programmable LED. It is a microcontroller with an attached RGB LED. The idea is to implement PWM to control the color and brightness of the LED and put it in the controller. That means you have an abstraction level to make your programming easier. You can simply order “fade to red” or “fade to blue”. Arduino is a great prototyping platform and most of you probably know already about it. If not, check out the Arduino pages and the Arduino playground and dive into it. A couple of month ago I ordered my first Arduino board. It was one of the Diecimila revision. As I often try something on my breadboard, I found out, that it can get troublesome to connect the Arduino with the breadboard over and over again. Others found that out as well and have solutions for that. An Arduino clone that snaps nicely onto your breadboard, e.g. Boarduino or RBBB. So what to do if these boards are far away across the ocean and it is holiday season everywhere? You may have guessed it, we build it on a prototype board. Christmas is coming closer, so here is my contribution to put you in the right mood. It is a blog hitcounter, that rings a bell. Literally. It puts a smile on your face, every time someone hits your blog. And it is a great way to annoy your colleages or your girl friend. It consists of an Arduino board, a bell, a servo and a couple of lines of code in c, python and php.